click, trash: Make a run. If successful, instead of accessing, pay Xcredit to access up to X cards from this server, if able. X is the number of tags you have. "Who watches the watchers? We do." If the Runner uses Counter Surveillance to run on R&D, but they have fewer credits than tags by the time the run is successful, what happens? The Runner cannot pay the full cost, so the Runner’s access step is replaced with accessing no cards. If the Runner uses Eater during a run initiated by Counter Surveillance, what happens? The effect on Counter Surveillance is required, so the Runner pays the credits but then accesses no cards. 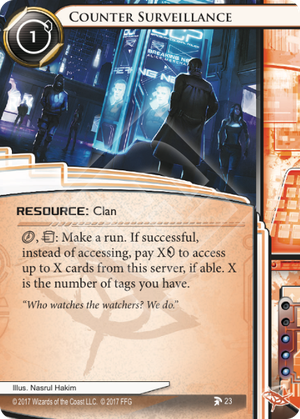 If the Runner uses Counter Surveillance to run on R&D, can they distribute the accesses as they choose among cards in R&D and upgrades installed in the root of R&D? No. Counter Surveillance only allows the Runner to access cards from the attacked server, and cards in the root of central servers are not in those central servers. If the Runner uses Counter Surveillance to run on R&D with two tags and an R&D Interface installed, how many cards does the Runner access from R&D? The Runner pays 2 credits to access three cards from R&D. OK, I have to say it. I hate this card, and I hate its design. In A:NR, tags represent the fact that the Corporation knows who the runner is. With one tag, they can already try to kill him, make him poor, take back some agenda, trash his stuff, etc. With two tags, they know enough about the runner to use a surgical strike (or two). With more tags, they can do weird things. In any case, a tag is a handicap for the runner. Now, the runner can survive with this handicap. Strategies exist for the runner: keep the Corporation poor (Account Siphon, Vamp, Lamprey, Wireless Net Pavilion, Fall Guy), put on some protection (Plascrete Carapace, Sports Hopper, Brain Chip, etc.). I think that the tag mechanism is great because it makes for interesting timing decisions. Look at the 2016 Worlds finale to convince yourself. Floating tags is doable, but is always a tough decision. There is a similar element on the corp side, and that's bad publicity. Getting bad publicity is annoying for the corp because you are giving the runner money to access your precious servers and trash the precious assets that you set up with all your love. And while this may not be as punishing as being blown up, there are very few ways to remove bad publicity, and it gets rid of very few of them. So recently, the game designers decided to make tags a good thing for the runner. I think Data Leak Reversal was already a bad design. Together with Citadel Sanctuary and Power Tap, you want to get tagged, and you make money while doing so. But then, Jarogniew Mercs protects you from damage, Counter Surveillance gives you a lot of accesses, Obelus gives you the draws and the hand size protection, and Mars for Martians gives you the economy. And Valencia's bad pub protects you from The All-Seeing I. There has been a couple of Corp cards that benefit from Bad Pub. Ireress is a very bad one: it only negates your bad pub, if the runner runs on the server where you installed this ICE. Illicit Sales gets a pass because a) it is very funny, b) it is not super powerful, c) 3-for-1s are not that great, and d) there is no good way for the Corp to negate scores of bad publicity. Now, in my opinion, both tags and bad publicity are things that help the other side. In a sense, they could totally ignore it. The Corp could decide that, while they know the type of cereals that the runner eats for breakfast, they will dump all this information and not use it. Actually I believe that, since tags and bad pub can be beneficial to the party who has them, there should be a way for the other party to remove them at no cost. An interesting card with an enticing effect. If you have a lot of tags you can make a really deep dig into, usually R&D. Tags allow the corp to trash resources so you'll want to install Counter Surveillance the turn you play it. That's not a major issue given the potential payoff. The bigger issue is getting tags. If you play against a kill deck you probably don't want to float tags or you need to put in a lot of damage prevention. If you play against a non-lethal deck (e.g. kill all resources and money NBN) you need to figure out a way to get enough money to trigger this at the right time and get through to the server. If you play against a non-tag-using deck you need to find ways to tag yourself. Account Siphon - Two tags and a great way to get money and annoy the corp. 4 influence outside criminal though. Code Siphon - One tag and a good way to install a program from stack with a discount. 4 influence outside shaper though. God of War - One tag per turn. The only repeated tag giver that can be installed multiple times (at the cost of memory). Jarogniew Mercs - Only one tag but combos well with Counter Surveillance since it's more powerful if you have more tags. John Masanori - One tag for the first unsuccessful run per turn. Will rotate out soon however. Joshua B. - One tag per turn and one extra click per turn. Will also rotate out soon. Maya - Potentially one tag per turn if you can consistently get into R&D but 3 influence outside shaper. Security Nexus - Guaranteed one tag per turn if you're willing to make an unsuccessful run every turn. 3 influence outside Sunny. Tallie Perrault - One tag every time the corp plays a gray ops (relatively uncommon) or black ops (mostly Weyland kill cards). Will rotate out soon. Vamp - One tag and a way to make the corp lose as much money as you. Will rotate out soon. Of these options two jump out as most interesting. Account Siphon is a staple of criminal decks so if you use Counter Surveillance as a criminal it'll do the job nicely. Account Siphon is also an event, which means Same Old Thing can trigger it again (I guess I don't need to tell criminals that). The other interesting card is Security Nexus, in particular because of some characteristics of Ms Lebeau. Sunny tends to be slow to set up so she needs big multi-access in the later parts of the game to win the race to 7 points. Sunny also has a very useful connection Jak Sinclair. Jak lets you make a run without using a click, but you can't use programs. If you're going to use Security Nexus to bounce off ice and get a tag you don't need programs so you can use Jak-time to get your tag. If the trace of Security Nexus fails you immediately end the run so even with scary ice the subs don't resolve. That makes a Jak / Nexus run for tag an ideal chance to run at some ice in front of an interesting server, if the corp rezzes you know the ice and the corp spent some credits, if they don't you get to see what's in the server. Jak is a resource however so he could be trashed if you're tagged. That's not a great deal for the corp though. If you have a Security Nexus Jak is free to install (Sunny has 2, Security Nexus adds 1) meaning it's pretty cost ineffective for the corp to trash him (2 vs 1 to reinstall). Nevertheless, if you're going down this route you'll want to have spare clones of Jak. Because the Sunny breaker suite (GS Striker M1, GS Shrike M2, GS Sherman M3) costs 0 with Sunny's 2 you have space for money programs like Magnum Opus, solving the problem of getting credits without vulnerable resources. There is another way to play Counter Surveillance however, one which doesn't require you to build your deck around it. You just throw it in an anarch deck as a one-off and use it if the corp pulls something like a Hard-Hitting News to make them regret that decision. Seeing 4 extra cards is nothing to sneeze at and it could well lead you straight to victory. Because Counter Surveillance needs either a deck built around it or is only useful against specific strategies it's not a widely applicable card. It does have a strong, potentially game winning effect though which makes it feel well-balanced. EDIT 2017-07-21: Added Jarogniew Mercs and God of War. If this card is played together with Obelus, do I draw before accessing all the paid cards (number of tags) are accessed? Because that's the way it is implemented on jnet at the moment and I am not sure whether that is correct. Number of tags 10. I install Counter Surveillance, run and trash that card (run on RND) with Obelus installed. Now what happens? Do I draw 10 cards before looking at each single card of the top 10 in RND (like it is implemented) or do I access first, then draw (like I think) (is important against kill decks).